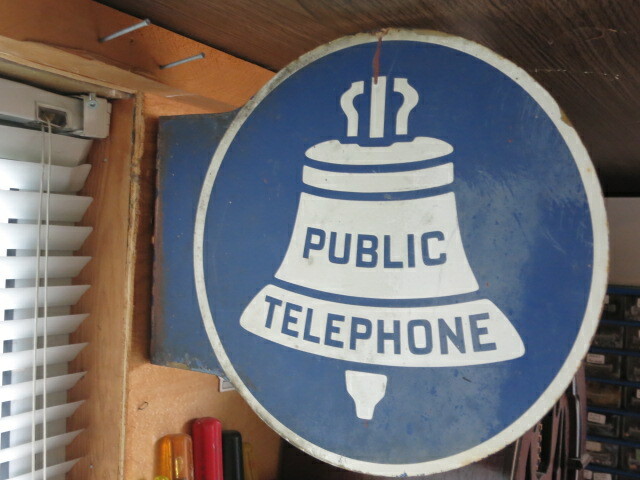 SKU TS01.Blue pay phone sign: "Telephone Pay Station" . Size: 8" x 18". SKU: TS01. 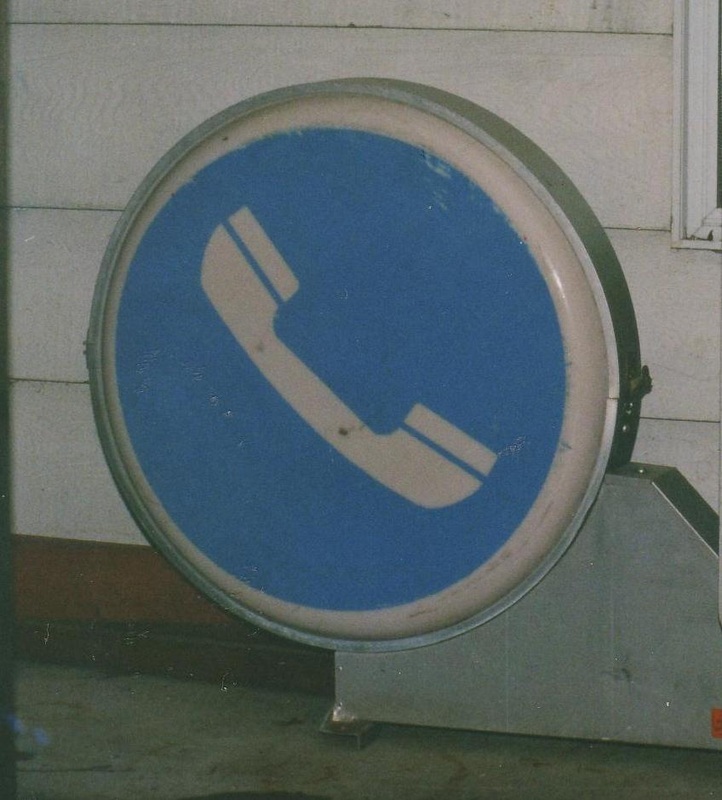 White pay phone sign. 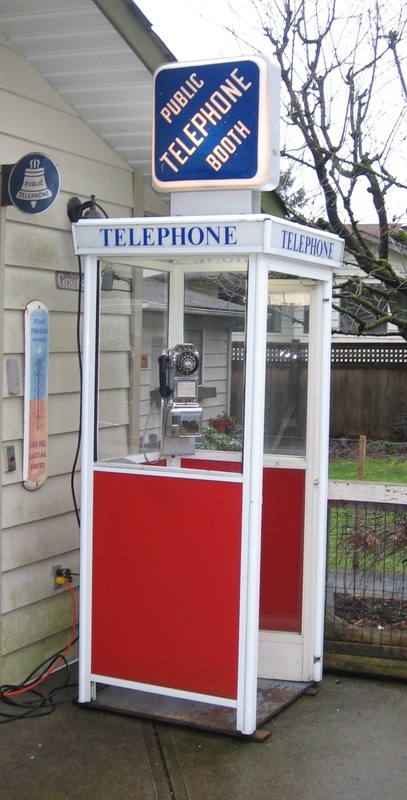 "Telephone Pay Station". Size 8" x 18". SKU TS02. 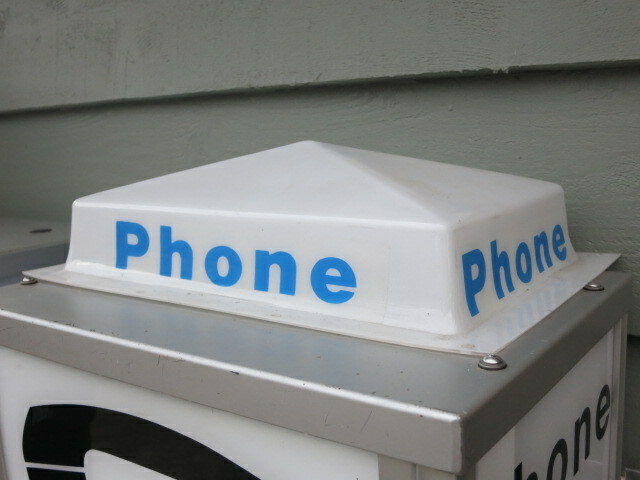 Blue pay phone sign: "Public Telephone" Size: 9" X 11". SKU TS03. 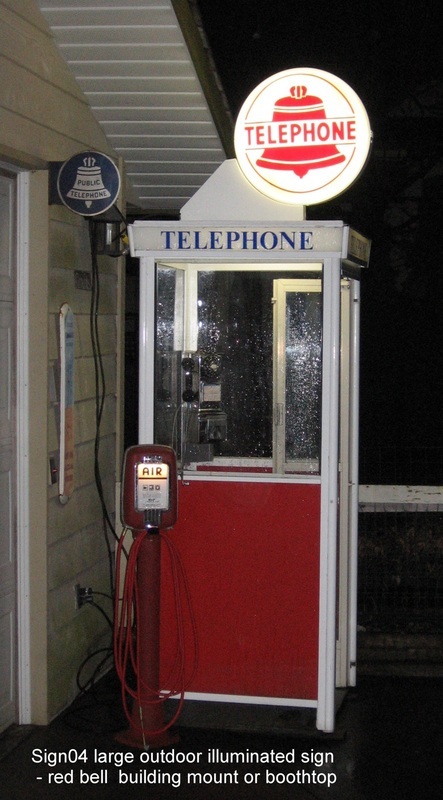 Blue & red pay phone sign:"British Columbia Telephone Company- Public Telephone Station". Size: 16" x 18". SKU TS04. 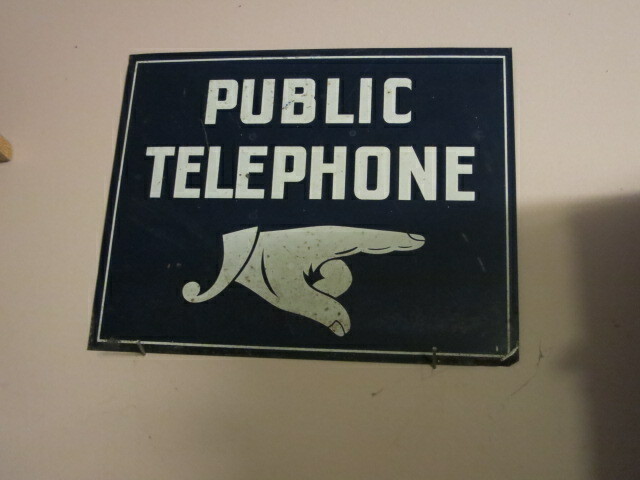 Blue pay phone sign: "Public Telephone". Size: 8" x 18". SKU TS05. Blue pay phone sign Public Telephone - Local and Long Distance. Size: 11" x 11". SKU TS06. 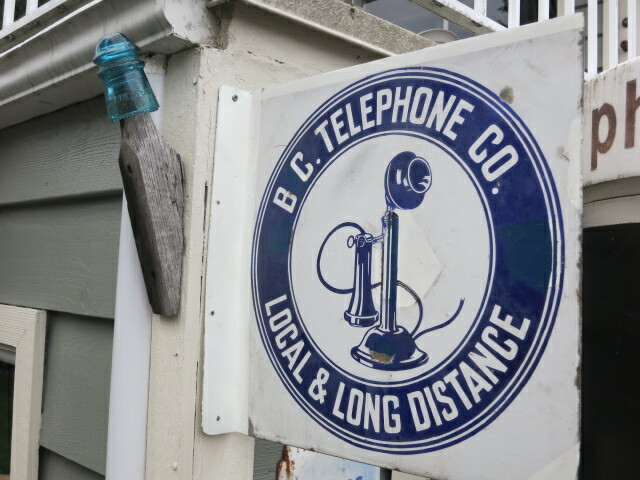 Blue & white pay phone sign: "BC Telephone Co. - Local & Long Distance". Size: 16" x 16". SKU TS07. 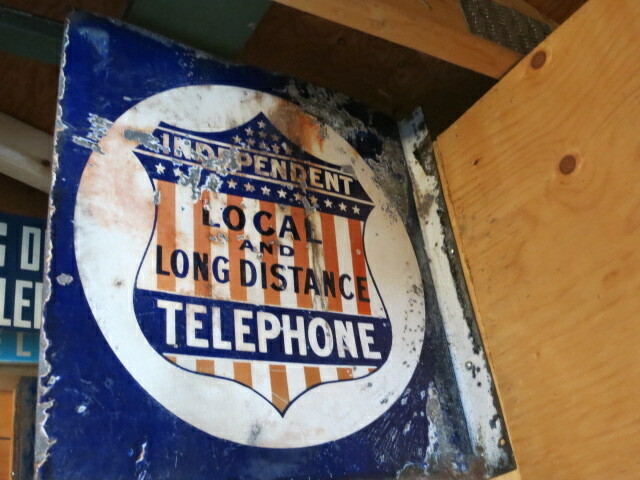 Red, white & blue pay phone sign: "Independent Telephone: Local & Long Distance". Size: 12" x 12". SKU TS08. 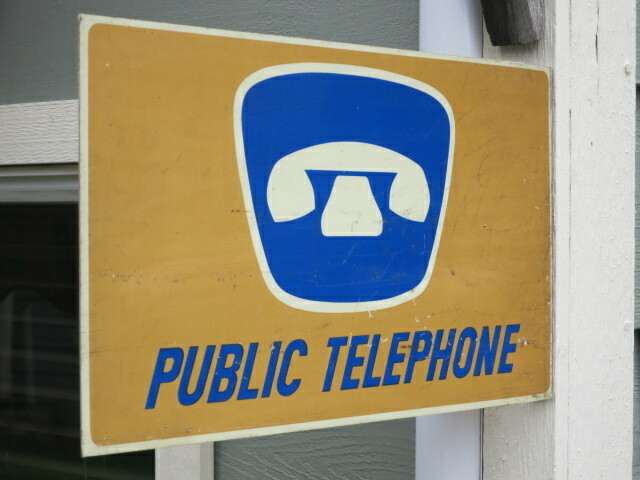 Yellow & blue pay phone sign: "Public Telephone" with telephone image. Size: 18" x 10". SKU TS09. 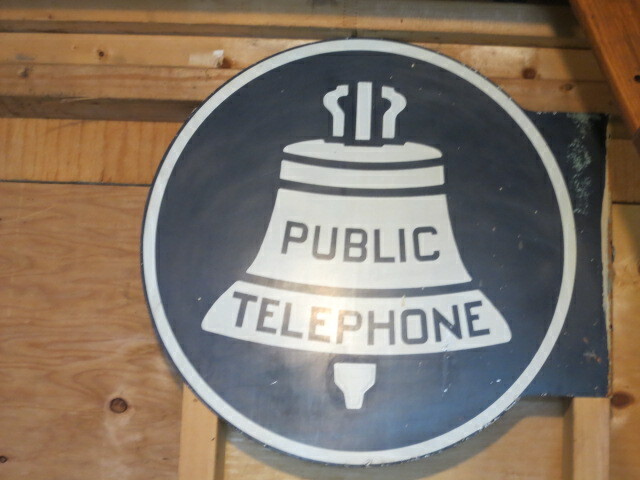 Blue pay phone sign: "Public Telephone" with Bell symbol. Size: 18" x 18". Circa 1939. SKU TS10. 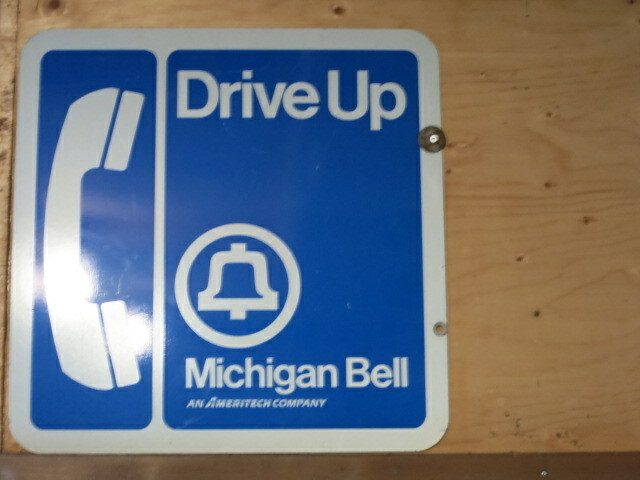 Blue pay phone sign: "Michigan Bell - Drive Up". Size: 18" x 18". SKU TS11. 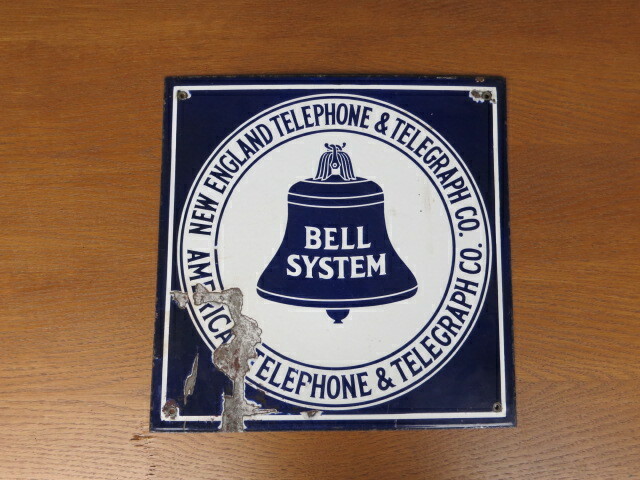 Blue pay phone sign: "Bell System: New England Telephone & Telegraph Co." Size: 16" x 16". SKU TS13. 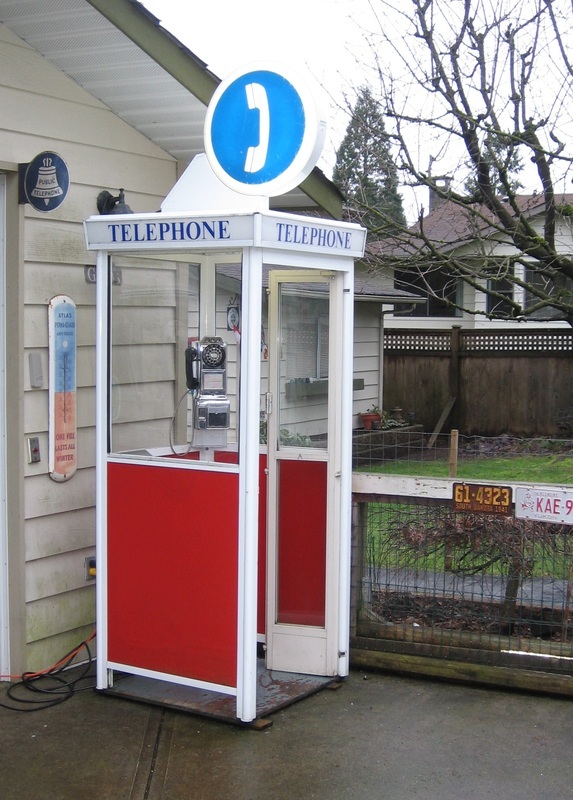 Blue pay phone sign: "Public Telephone" Size: Round 12" . Circa 1939. SKU TS14. 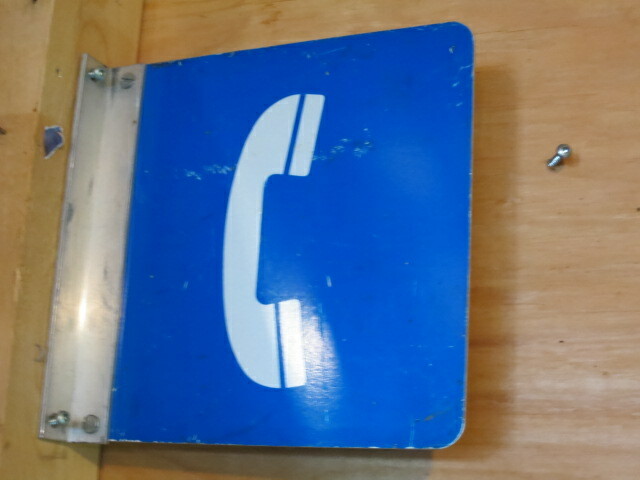 Blue pay phone sign with handset. Size: 8" x 8". SKU TS15. 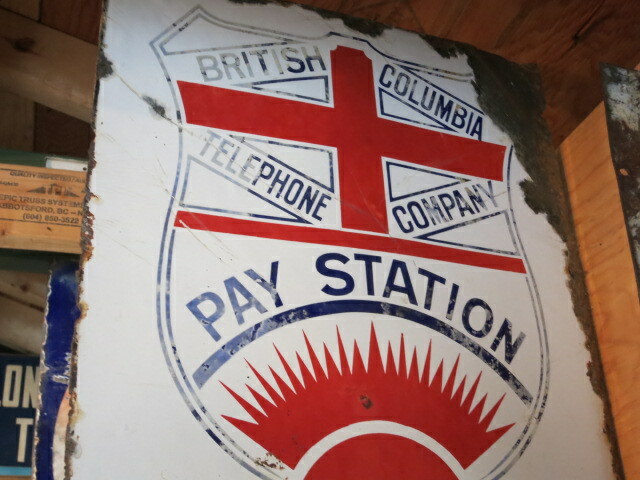 Blue & red pay phone sign: "British Columbia Telephone Company - Pay Station". Size: 16" x 18". SKU TS16. 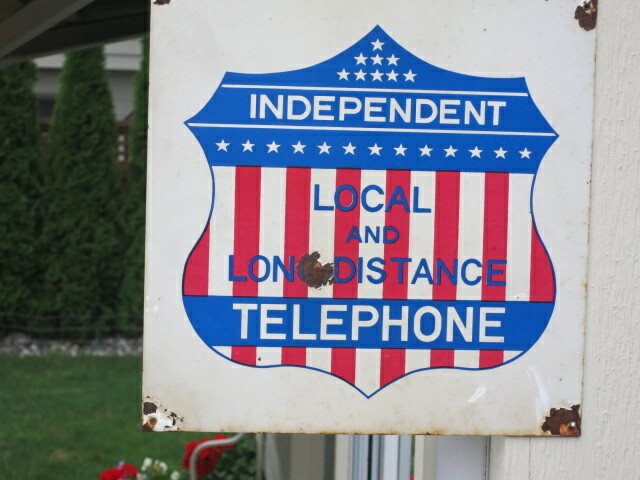 Red, white & blue pay phone sign: "Independent Telephone: Local & Long Distance". Size: 18" x 17". SKU TS17. 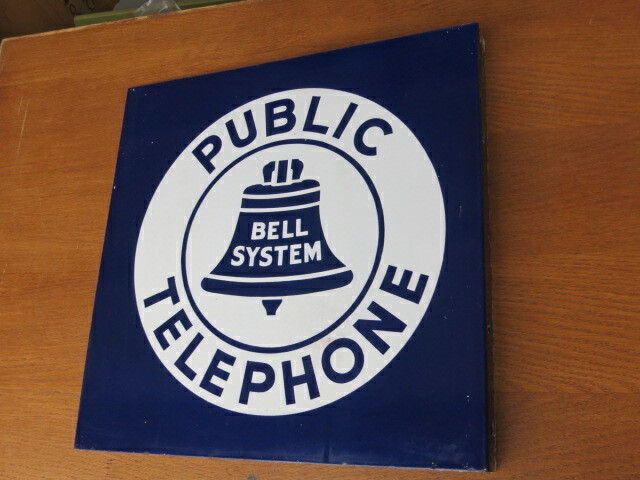 Blue pay phone sign: "Public Telephone - Bell System". Size: 18" x 18". SKU TS18. 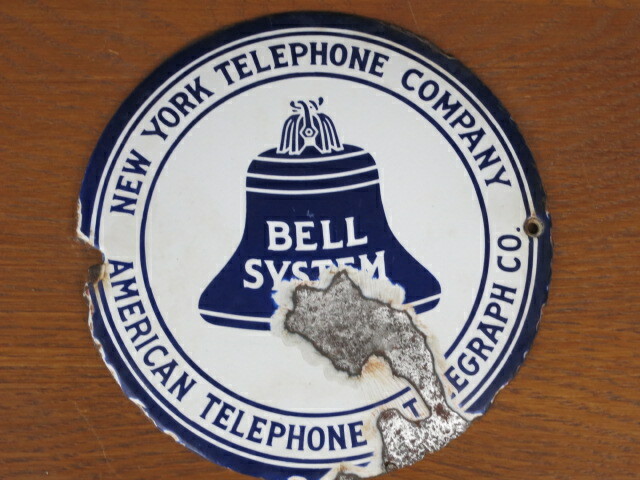 Blue pay phone sign: "New York Telephone Company - Bell System". Size: Round 8". Circa 1910. SKU TS19. 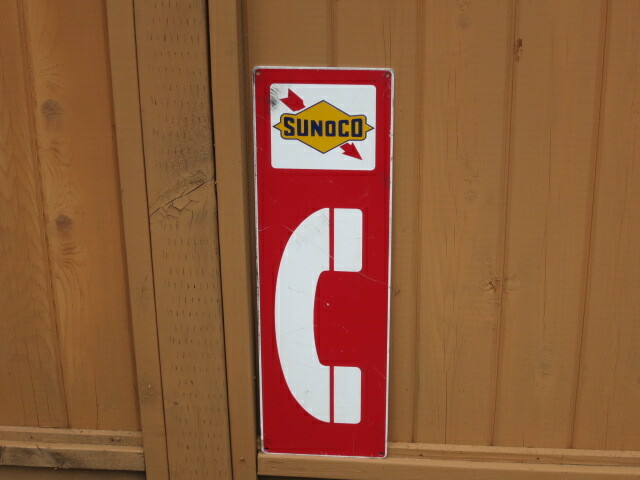 Red pay phone sign: "Sunoco" with phone icon. Size: 8" x 25". SKU TS20. 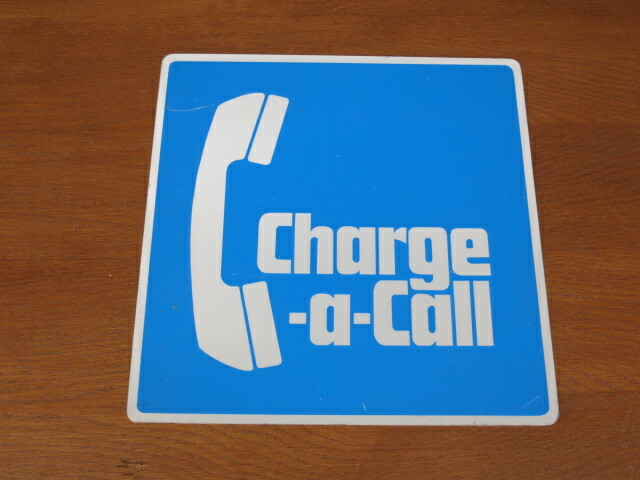 Blue pay phone sign: "Charge-a-call". Size: 15" x 15". SKU TS21. Green & yellow interior plastic pay phone sign: "Telephone". Size: 3" x 23". SKU TS22. 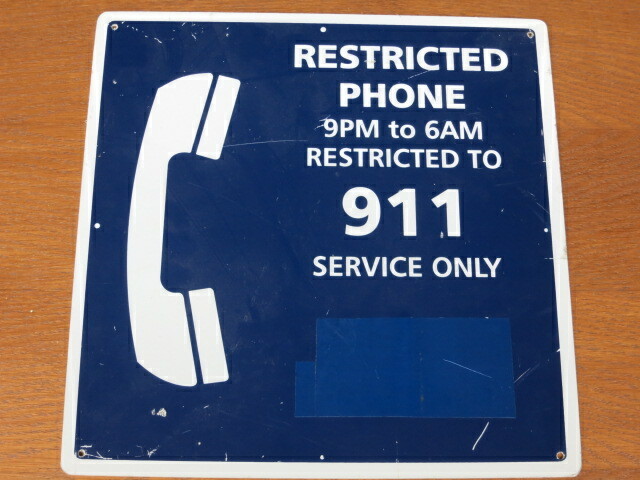 Blue pay phone sign: "Restricted Phone - 911". Size: 15" x 15". SKU TS24. 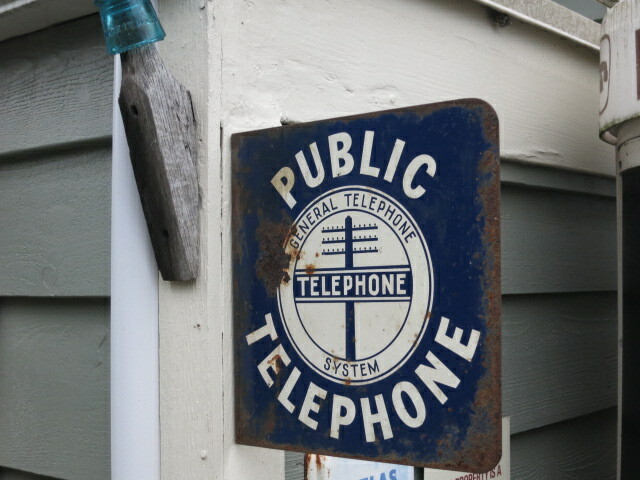 Blue pay phone sign: "General Telephone System -Public Telephone" with telephone pole cross arms and insulators. Size: 12" x 12". SKU TS25. 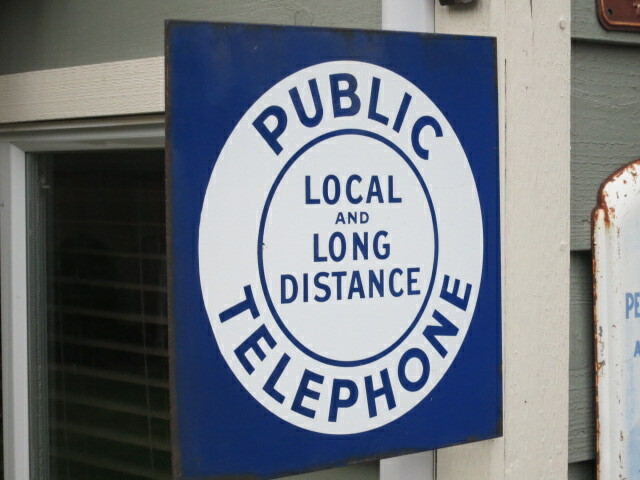 Blue pay phone sign: "Public Telephone - Local & Long Distance". Size: 14" x 14". SKU TS26. 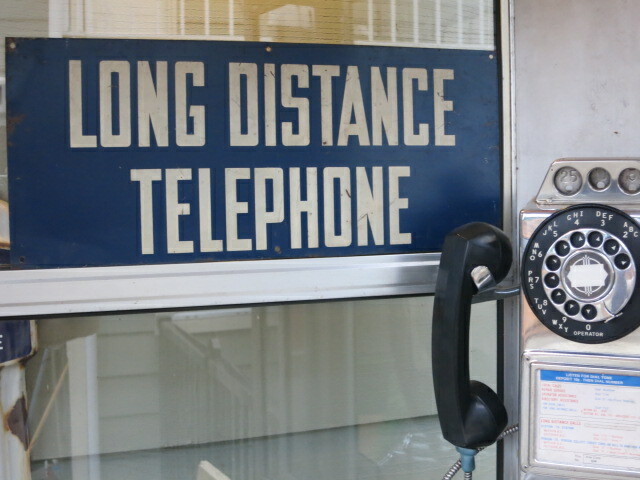 Blue pay phone sign: "Long Distance Telephone". Size: 8" x 18". SKU TS27. 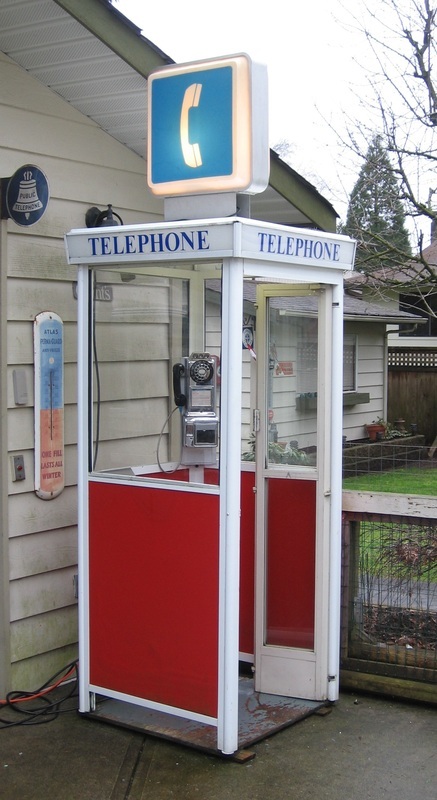 Blue pay phone booth sign: "Telephone - Bell System". Size: 4" x 20". SKU TS29. 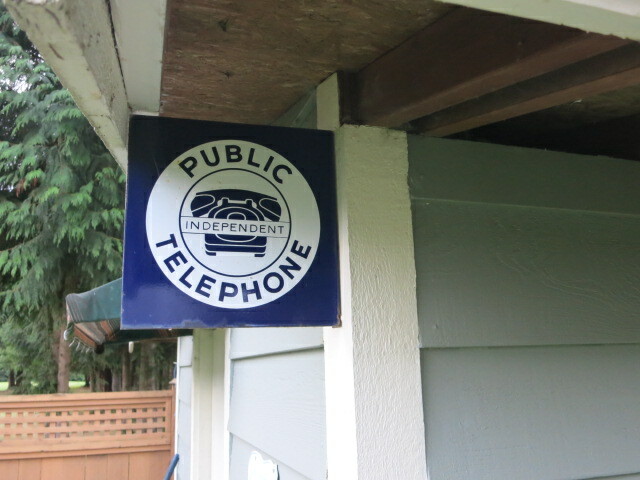 Blue pay phone sign: "Independent - Public Telephone" with phone image. Size: 11" x 11". SKU TS28. 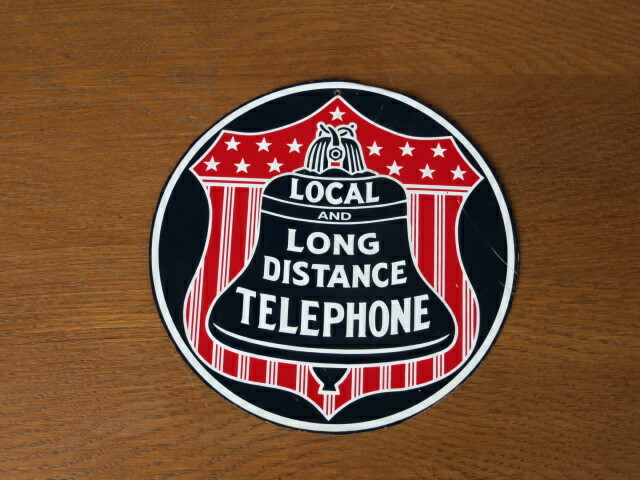 Red, white & blue pay phone sign: "Local & Long Distance Telephone. Size: Round 9". 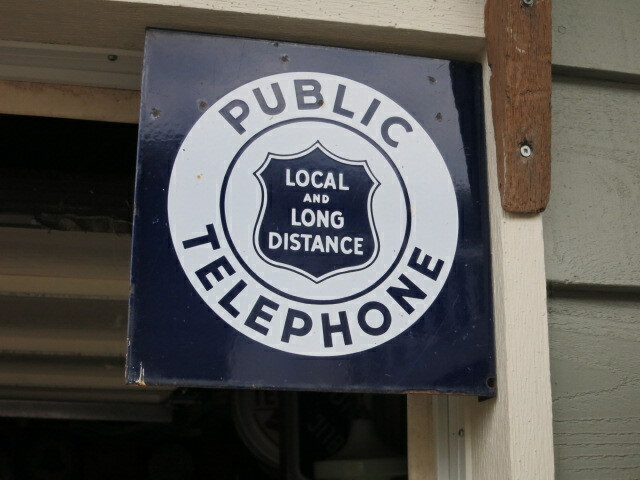 Reproduction of 1910 sign. SKU TS30. 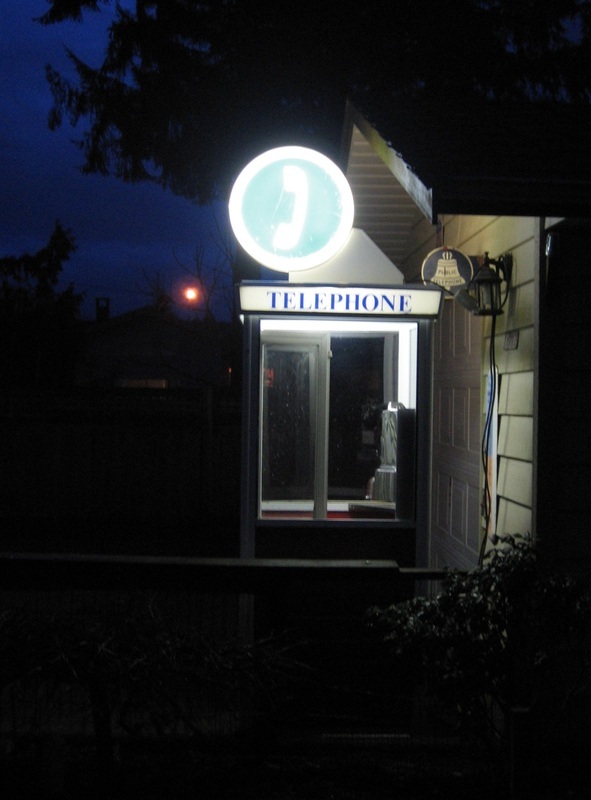 White pay phone booth plastic illuminated canopy. Square: 15" x 10". SKU TS31. 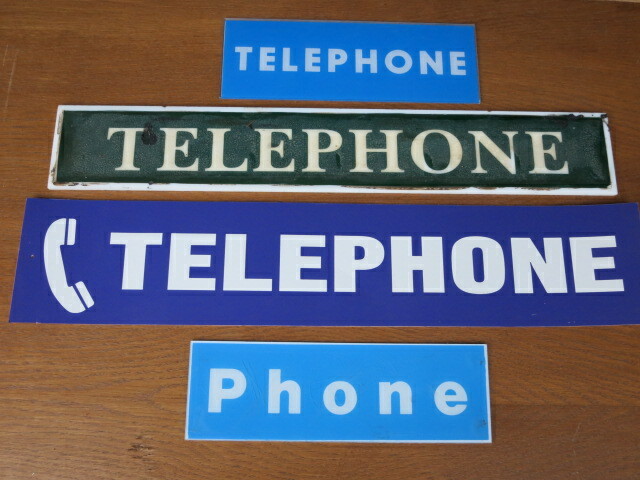 Pay phone signs - assorted. 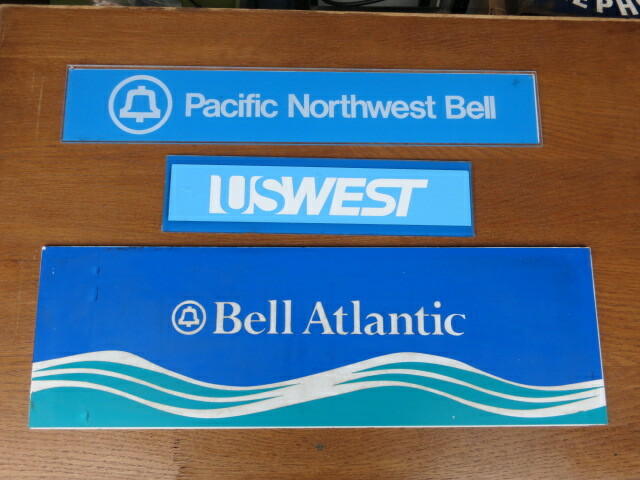 Pacific Northwest Bell: 4 1/2 " x 25 1'/2'. US West: 5 1/2" x 25 1/2 ". Bell Atlantic: 8 1/2" x 27 1/2". SKU TS32. 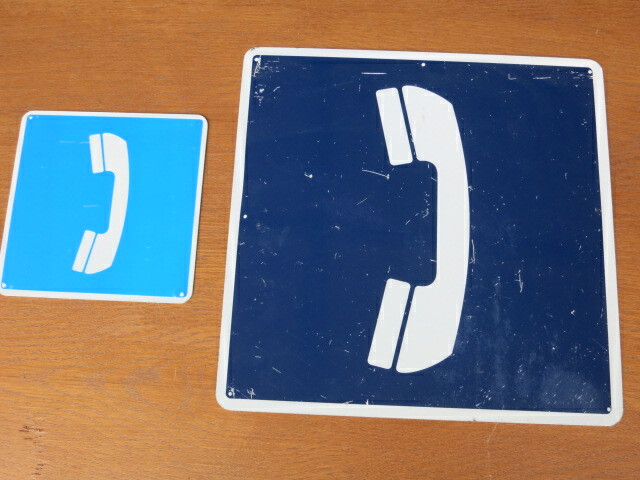 Pay phone signs - assorted sizes. 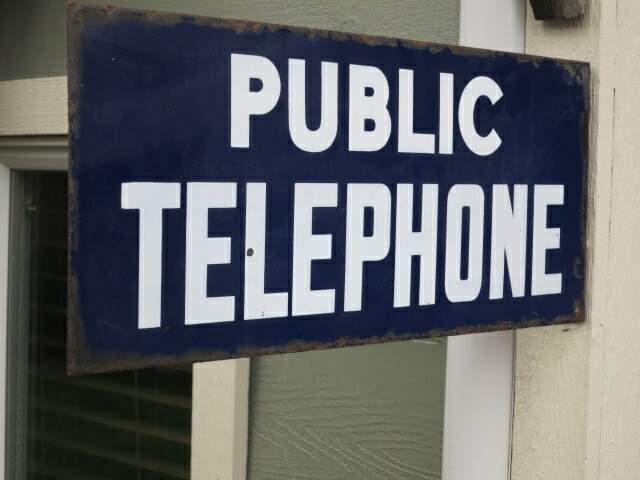 Green phone booth sign: 4" x 24 1/2". SKU TS33. 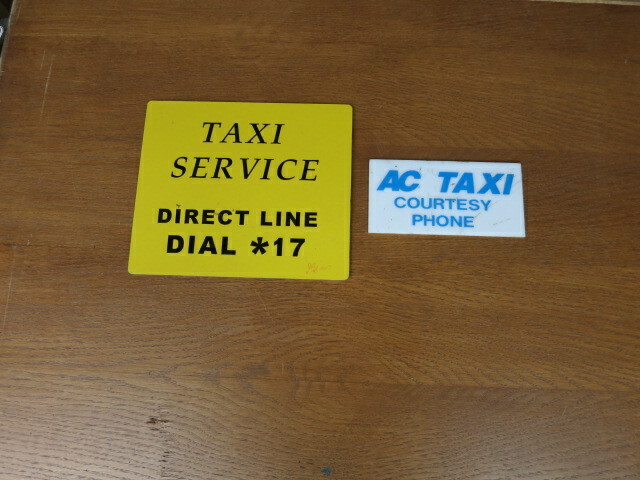 Taxi signs. Yellow: 9" x 10". White: 3 1/2" x 7". SKU TS34. 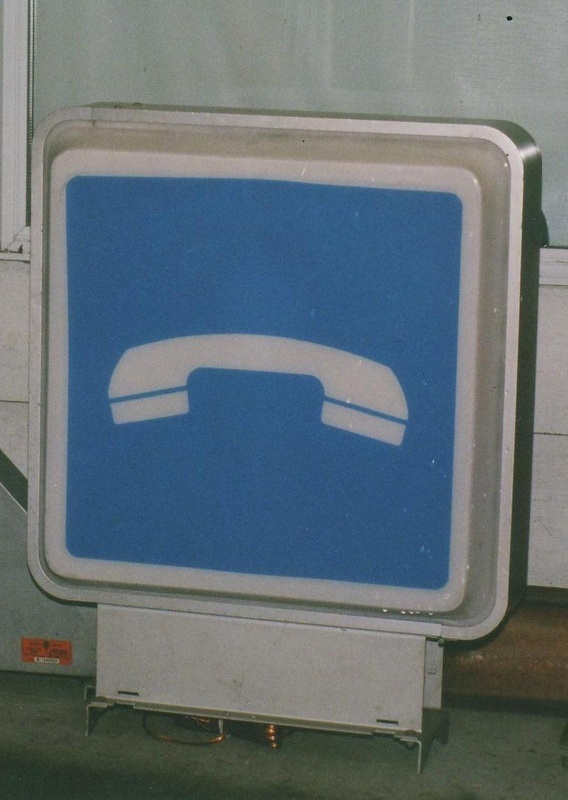 Blue stand-up 4-sided illuminated pay phone sign with handset image. Size: 24" high with 8" sides. SKU TS35. 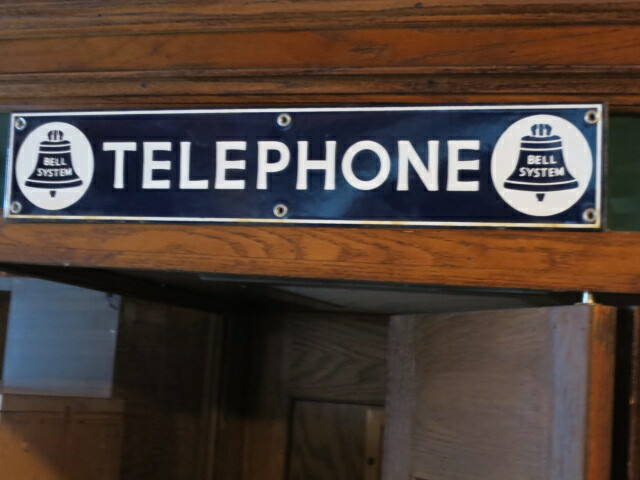 Blue illuminated pay phone sign with handset image. Square 2 sizes: 20" x 20" and 23" x 23". SKU TS35. Shown on outdoor booth. SKU TS35. 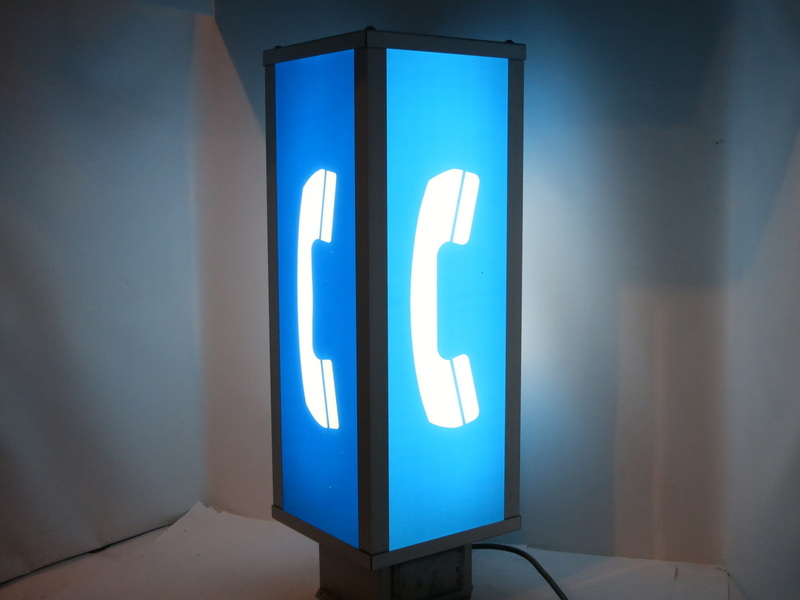 Blue & white illuminated pay phone sign with handset. Round 24". SKU TS35. Shown on phone booth at night. SKU TS37. 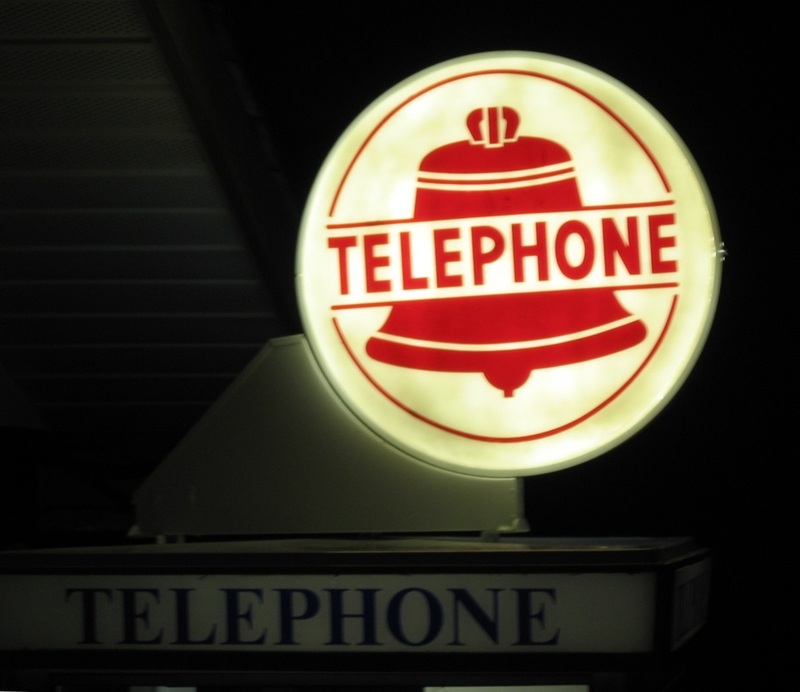 Red & white illuminated pay phone sign. Round 24". SKU TS37. Shown on phone booth at night. SKU TS38. 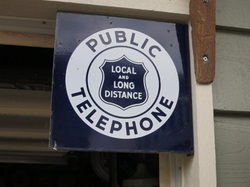 Blue illuminated "Public Telephone Booth" sign. Square' 20" x 20".